Come up the stairs to the 2nd Floor. Continue straight until you reach Reference Counter 3 (International Materials ). Then turn left and head straight until you reach this counter. Inquiries can be addressed on our Local and Special Material Collections as well as on our collection of archival, administrative documents and ancient writings. Reading archival documents and ancient writings through microfilm is also possible. 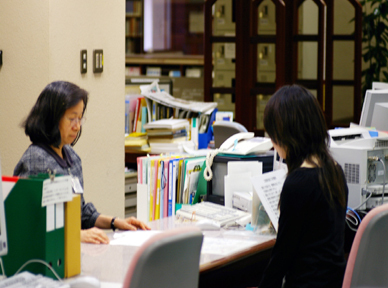 For those who wish to conduct research on festivals, individuals, historical events, customs and towns associated with the city of Fukuoka, please consult our staff in charge of our Local and Special Material Collection.